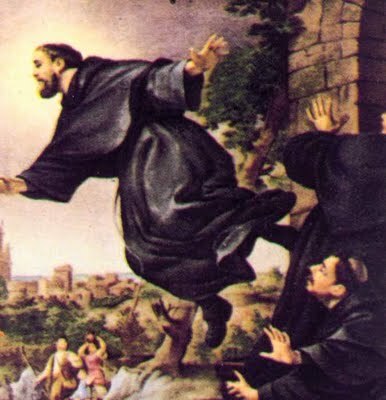 Today is the feast day of St Joseph of Cupertino. To learn about his life go here. Joseph was born into a poor family in Cupertino, Italy in 1603. His father was a poor carpenter who died before he was born, and his impoverished mother gave birth to him in a stable. The poor boy started out with no advantages and his misfortune continued. To put it bluntly, he was stupid to the point of being unteachable. Everything he attempted he failed. His ecstasies began early in life and he would suddenly stop and stand and stare–totally distracted as if in a trance. He got the idea that if he was good for nothing he might make it as a friar, but his lack of education meant the friars wouldn’t have him. Finally he was accepted only to fail and be rejected and went wandering as a beggar. Eventually he returned and offered to be a servant at the friary and look after the mule. Somehow by God’s providence he made it through to ordination as a priest. His ecstasies, visions and mystical experiences were legendary. He heard heavenly music, went into such a complete trance that he could be dragged about, pierced with needles and burnt with candles and it would have no effect. Most famously he is said to have levitated while in the trance state. Elaborate legends about him flying developed: he flew up into a tree to talk with birds, he flew up to help workmen place a memorial cross into the ground, he flew around the church during Mass. Well maybe or maybe not. We have take the more exaggerated stories of St Joseph’s flight with a pinch of salt. In the face of supernatural phenomena the church expects us to take a position that is neither gullible nor cynical. In other words, we must look first for every natural explanation, but on the other hand we must not rule out the possibility of miracles and the supernatural. In today’s world Joseph of Cupertino would probably be regarded as severely mentally retarded. He was a misfit mystic. Quite apart from his mystical experiences his life of asceticism was so extreme that some people would say he had an eating disorder, that he was emotionally or mentally ill. During his lifetime he was accused of witchcraft and reported to the Inquisition. PatheosDwight2014-09-18T07:06:25-04:00September 18th, 2014|Categories: Saints and Supernatural|Tags: Saints, spirituality, supernatural, weird church stuff|Comments Off on Could St Joseph of Cupertino Really Fly?